The 47.85 metre tri-deck motor yacht Never Enough, listed for sale by David Wiest at RJC Yacht Sales, has had a further $500,000 price reduction. Built in aluminium by US yard Trinity Yachts to ABS class and MCA compliant, Never Enough was delivered in 2006 and refitted in 2014. An interior in rich mahogany by Evan K Marshall accommodates up to ten guests in five cabins, comprising a main deck full-beam master suite, VIP suite, two doubles and a twin. All guest cabins have entertainment centres, television screens and en suite bathroom facilities, while a further four en suite cabins can sleep up to eight crewmembers aboard this yacht for sale. The open-plan main saloon has large windows to allow plenty of sunlight to flood the area and comes with silk-upholstered sofas and armchairs, a wet bar, ice maker and an entertainment centre including a 55-inch Samsung television screen and a Denon stereo surround sound system. Forward is a formal dining area with a custom table and seating for up to ten guests. Al fresco entertaining and dining is available on the air-conditioned main deck aft or upper deck aft. Up on the flybridge, more outdoor dining is offered at an oval teak table and further amenities here include a full wet bar, six-person Jacuzzi, an infrared barbecue grill and a 50-inch Samsung television screen. Twin 3,789hp Caterpillar diesel engines power her to a maximum speed of 20 knots and a range of 3,700 nautical miles at 12 knots. 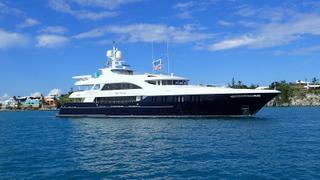 Lying in Fort Lauderdale, Florida, Never Enough is now asking $15,400,000.